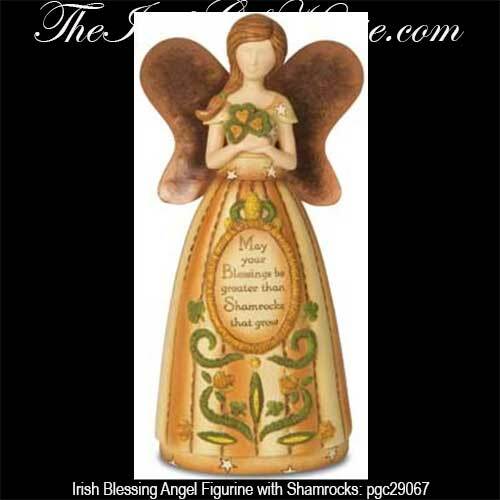 This Irish angel figurine features shamrocks along with an Irish blessing. This Irish angel is holding a shamrock and she is enhanced with an Irish blessing along with additional shamrocks and a floral motif on her dress. The Irish angel figurine features a colorful resin design and measures 6 " tall with a 3" wide wingspan; she also has felt pads on the base along with copper color metal wings. The Irish blessing angel is gift boxed with a shamrock history card, compliments of The Irish Gift House.